The Aveo RS has an aggressively styled face and deep front grille. 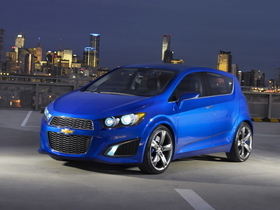 MUNICH -- Chevrolet today unveiled the Aveo RS show car, which will make its debut at the Detroit auto show next week. Chevrolet said the Aveo RS features a European-inspired “hot hatch” look designed to appeal to young enthusiasts and provides a preview of the next-generation Aveo. 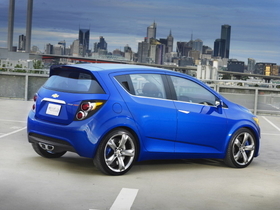 Chevrolet Europe President Wayne Brannon said the next Aveo will launch in Europe in 2011, boosting the brand's lineup already enhanced by the recently introduced Cruze compact model and Spark minicar. "The Aveo RS concept shows clearly that we are ready to make a big step forward in the small car segment," Brannon said in a statement. Chevrolet said the Aveo RS is longer, wider and more spacious than the current Aveo and showcases exterior and interior upscale-looking design cues. The concept also highlights many personalization options potentially available on the next-generation Aveo. The Aveo RS show car is powered by a 138-hp, 1.4-liter turbocharged gasoline engine mated to a six-speed manual transmission. It sits on 19-inch gun metal alloy wheels. The Aveo is due to go on sale in the U.S. in 2011 with production for the North American market starting later this year at Orion factory in Michigan creating 1,200 jobs. Aveos for the European market are made in Poland and Korea. An integrated rear spoiler, center-mounted exhaust and chrome exhaust tips give the Aveo RS a sporty look.